Specifically designed for hot water boiler systems. plus temperature in °F and °C. Large, easy-to-read 3½" square dial. Designed for hot water boiler systems. 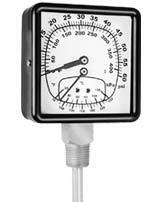 Two-Gauges-In-One... they measure water pressure in PSI and H2O feet, plus temperature in °F and °C. 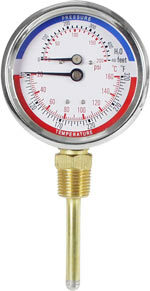 2½" Tridicator, 0-75 PSI/170 Ft. H2O, 60-260°F, 20-120°C, ¼" NPT C.B.M.